The timeline below shows the average percentage of airtime (as measured in 15-second intervals) on CNN, MSNBC and Fox News, combined by year, from June 2009 to present that mentioned either “climate change” or “global warming” (using data from the GDELT Project’s processing of the Internet Archive’s Television News Archive). 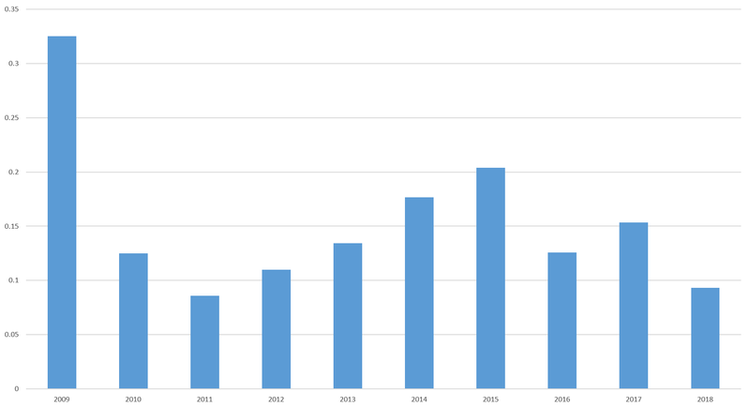 The immense media coverage of the 2009 Copenhagen conference is starkly clear, as is the steady increase in coverage over President Obama’s fourth through seventh years in office, culminating in the 2015 Paris accord. President Trump’s withdrawal from the agreement last year brought the fourth highest television coverage of the past decade. In contrast, the lack of major developments this year led to 2018 having the second lowest coverage. The earth’s changing climatic environment is typically referred to as either “global warming” or “climate change.” The former emphasizes a warming planet, while the latter focuses on warming, cooling and climate-enhanced extreme weather events. The bar chart below shows the percentage of airtime on CNN, Fox News and MSNBC over the past decade mentioning the two terms. 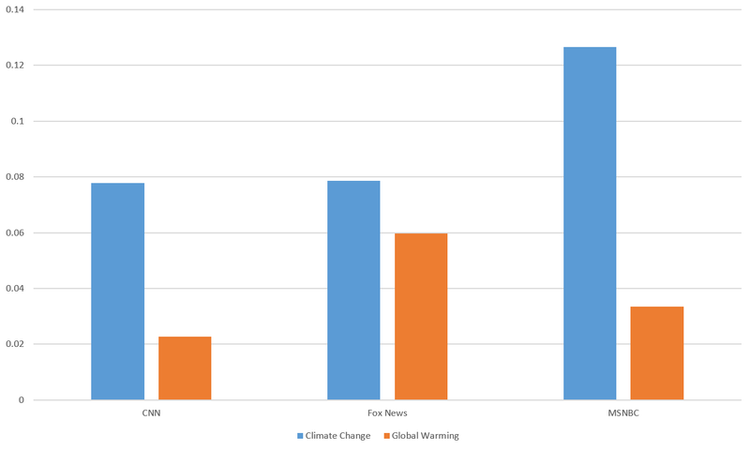 Fox News has used “global warming” nearly as much as the other two channels combined. MSNBC has spent 0.16 percent of its time on the two terms combined, followed by Fox News at 0.13 percent and CNN at 0.10 percent. Turning to worldwide online news coverage, the timeline below shows the percentage of coverage in the 65 languages monitored by the GDELT Project that mentioned either of the terms. Here again, “climate change” is the clear favorite, mentioned 3.7 times as often as “global warming.” The relative dearth of climate change coverage in 2018 can also be seen below, with media interest finally picking up in early August, showing a brief burst in early October with the IIPC report release, and peaking over the past month in advance of COP24.